Handlebars are a key component in your riding posture and comfort. However finding bars that are right for you can be difficult, At Bikes Built Better we have made this process as painless as possible making sure our customers get the fit and style they want and need. Performance is not only horsepower and torque greater comfort on your motorcycle makes your ride more enjoyable and gives you more control. Handlebars are a key component in your riding posture and comfort. However finding bars that are right for you can be difficult, At Bikes Built Better we have made this process as painless as possible making sure our customers get the fit and style they want and need. Upgrading your handlebars is an investment. Make it the right way! 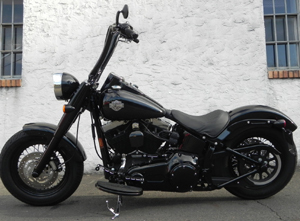 We carry handlebars from all the leading manufactures Wild 1's, Roland Sands, Burly, Krome Works, Flanders and more. The best thing we have found to ensure you get the best possible set up is to come in with your motorcycle. We need to see you on your motorcycle with your feet up to determine your riding posture and what size bars will help you achieve a better more comfortable riding position. With this information we can help you choose the bars in the style you want. 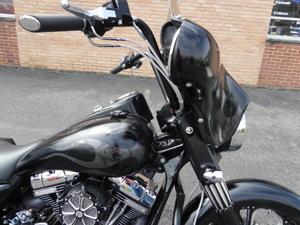 Now here is the deal if you are committed to upgrading the bars we will get the bars we think will work best for you and your motorcycle, mount them to your bike to try before we install all the cables and controls. This way you will be confident the bars are right for you. If they are not you are not stuck we will find others. Once you are happy with your handlebar selection we then install the wiring controls and cables. Get it done right the first time this process will take a couple days on average but we found it is the best way to insure you will be happy with your new handlebars. We aren’t done yet! Something else for you to think about before you upgrade your handlebars. 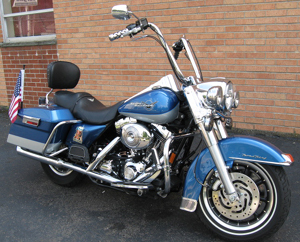 Motorcycle handlebars are not just about comfort and handing but are one of the key features of any motorcycle. When upgrading almost always you are at least going to have to change the brake line and many times all new control cables lines and wires are needed. So you may want to consider these options: Wiring Internal or External internal wiring is more labor intensive but much better looking particularly on tall bars. Also brake lines clutch cables and throttle cables all come in a variety of styles and can really accent the look of the whole motorcycle. More Comfort Better Handling and Awesome Appearance! Come on in with your motorcycle for a free handlebar estimate.